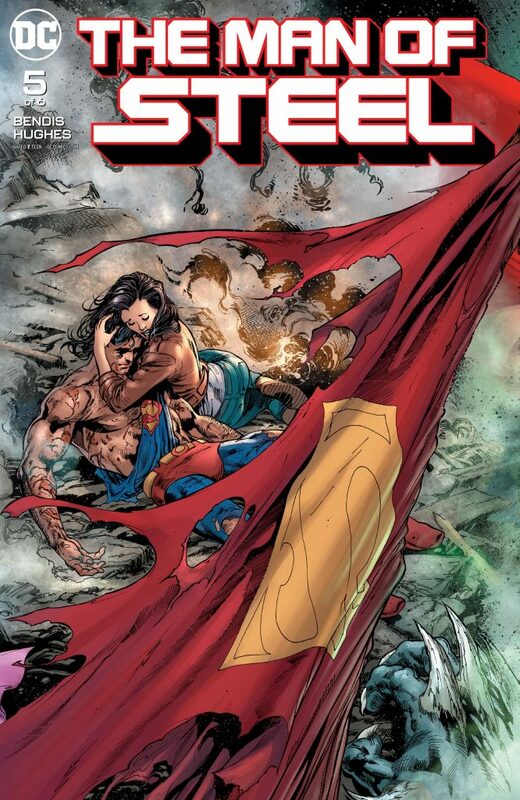 Death of Superman in ominous Man Of Steel 5 cover, alone, had me. The Brian Michael Bendis Superman mini-series, his first book in his D.C. Comics run, is enveloping, surprising and terribly suspenseful in its first 5 of 6 issues. But that Ivan Reis, Joe Prado, and Alex Sinclair The Man Of Steel 5 cover wrenched at my heart, just as Dan Jurgens’ cover of Superman 75 “The Death Of Superman” did as a kid so many years ago. 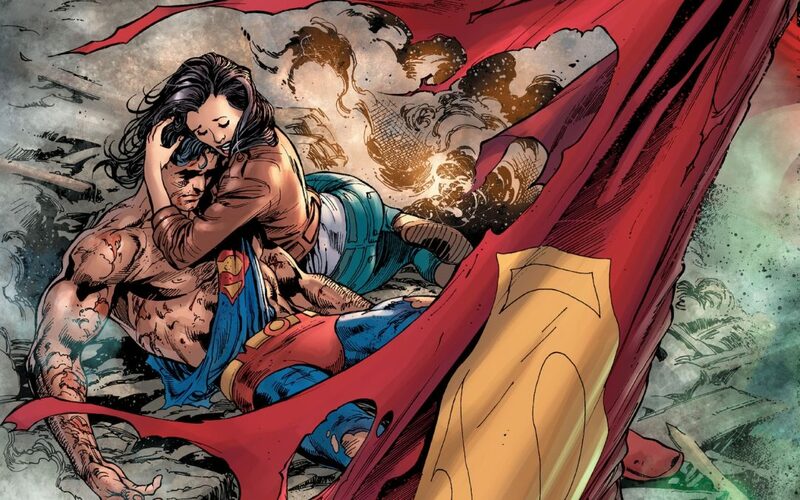 Lois cradling Superman in his torn duds, fallen among his seemingly dead enemy, Doomsday, with a tattered red cape flapping in the wind like an American flag gone through a battlefield is iconic. 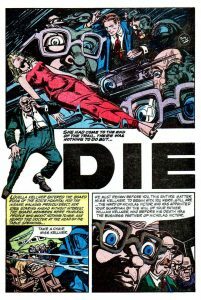 And this homage in The Man of Steel 5 alludes to rubble and a looming death for Superman and possibly for many others too. 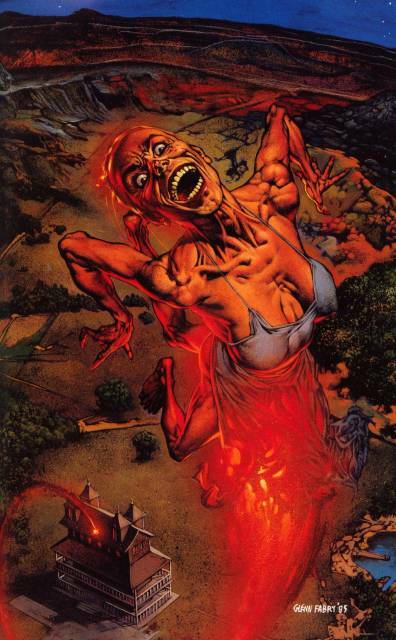 Rogul Zaar has been said to have destroyed Krypton, after all, and he is not happy that the son of Jor El escaped his ‘cleansing’ of the universe from the ‘plague’ of the Kryptonian ways. And so as he, this new menacing and mysterious zealot – though his past as a defender of the universes adds a lot more to his character than mere obsession – mops the proverbial floor with Superman and Supergirl in Metropolis, we learn to fear him. But at the start of Bendis’ fifth part of the tale, a giant eye peers down at the last Kryptonian city, Kandor. This is right before Rogul Zaar destroys the city of Kandor and its entire people. Superman and Supergirl are devastated that their promise to un-shrink the last living city of their home planet is dead. The brilliant artwork in this issue, done by Adam Hughes, Jason Fabok, and Alex Sinclair, is poignant in its depiction of the fury of the battles, the concerned faces realizing the stakes, the ominous flashback, and the ferocity of the situation. But with Superman’s true home, earth as his major concern, and thus a disadvantage to his human concern f, he takes the heavyweight title fight to space. And while the Justice League gathers in Metropolis, Zaar goes toe-to-toe with Supes and eventually succeeds in burying him, unconscious, within the surface of the moon. 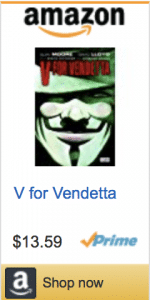 Wow, this villain is powerful! The flashbacks of Clark Kent, Lois, and their son Jon speaking to Jor El, who comes from who knows where, to take the descendant of El on a tour of the galaxies is key. It seems Lois may have either gone with their son, or just outright walked out on Clark who may have changed his mind and let their child go off-planet. The human element of Clark and Superman, written by Bendis, is again remarkable. 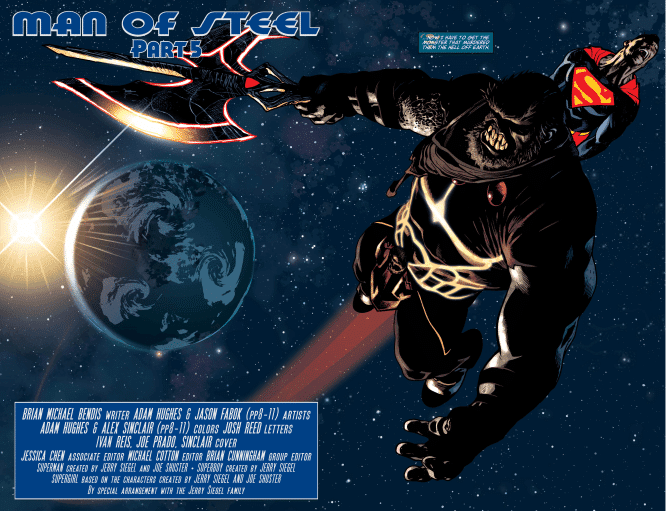 [See “Review: The Man of Steel #1 Brings New Humanity To Superman”]. We have a family gone to a dysfunctional state, and Jon would be a target of Rogul Zaar should he catch wind of his existence. Maybe Jor El really takes his grandson away to spare him the sight of his father dying for the sake of earth . . . again? So far Lois is gone, Superman is flirting with the new fire department captain, and Clark is riddled with concern over his son’s potential trip off planet. Does he foresee his own demise, defending earth to the last? Certainly Zaar is too great a foe for even the Justice League and the Green Lantern Corps standing guard. And Superman, the father, knows this, realizes shortly after being revived by the Justice League that he alone can stop Zaar’s plan and flies away alone. Clark knows that Zaar will see earth as a new planet to be sacrificed to the cause. Zaar must wipe out the world he sees as now infested with the touch of Krypton from one man to all of them spreading, like bed bugs. And at the heart of the moon is the ancient creature’s own doomsday device built within a fiery heart of unknowns. I have rarely been so excited to read a series and so anxious to revel in its finale! 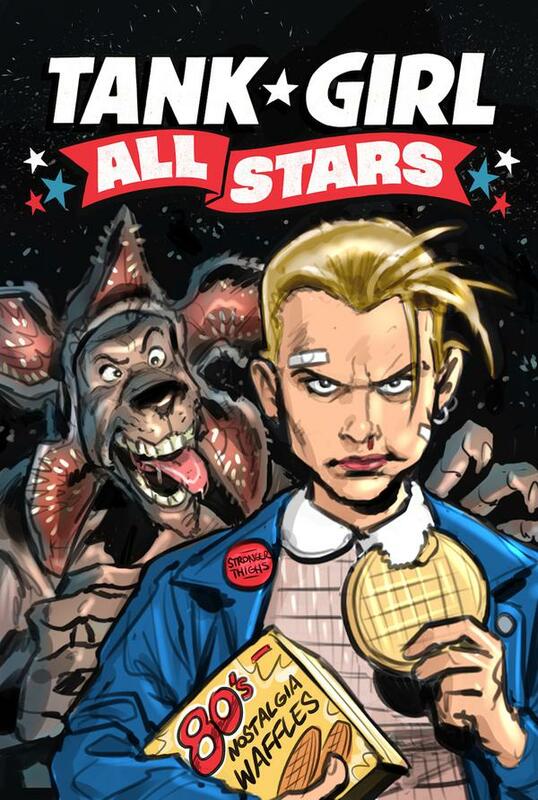 Be sure to pick up this book at your local comic shop, and if you are in Port Jefferson go right to my LCS Red Shirt Comics – they have them in stock . . . for now!